"Physiotherapists assess, plan and implement rehabilitative programs that improve or restore human motor functions, maximize movement ability, relieve pain syndromes, and treat or prevent physical challenges associated with injuries, diseases and other impairments. They apply a broad range of physical therapies and techniques such as movement, ultrasound, heating, laser and other techniques. They may develop and implement programmes for screening and prevention of common physical ailments and disorders"
International Standard Classification of Occupations(ISCO) is a tool for organizing jobs into a clearly defined set of groups according to the tasks and duties undertaken in the job. -a system that can be used directly in countries that have not developed their own national classifications. Physiotherapists and related associate professionals treat disorders of bones, muscles and parts of the circulatory or the nervous system by manipulative methods, and ultrasound, heating, laser or similar techniques, or apply physiotherapy and related therapies as part of the treatment for the physically disabled, mentally ill or unbalanced. The International Labour Organization (ILO) is the international organization responsible for drawing up and overseeing international labour standards. It is the only 'tripartite' United Nations agency that brings together representatives of governments, employers and workers to jointly shape policies and programmes promoting Decent Work for all. 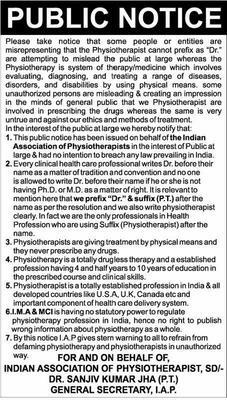 Now that WHO has classified Physiotherapists as an individual professionals, we all need to work on this to get the same status in India. Now or never.. I am very much happy to heard this from WHO,I urge colleagues to practice this our great independent profession with passion...God bless physiotherapy profession and physiotherapist . Really appreciated, I hope each physiotherapist will serve the humanity with trust,confidence,love and fashion of this great and independent profession. by: Dr. Usman Ex-boy "DPT"
Excellent achievement. Congratulations to all doctors of physiotherapy around the world and may God continue to bless our dearest profession. Am real thankful for this ,is real many people are not aware of physio but now we are going to improve day by day. Sir, we must make the general public aware of physiotherapy treatment. There are people who do not know about physiotherapist at all hence they do not come to our clinics. This is anticipated news and moreover we need to create the Government counsel for physiotherapy only then we can fully happy. 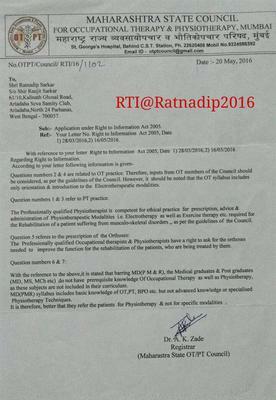 It clearly shows the independent nature of practice of physiotherapy field. As a Physio I have not only proud but have faith that in future the field will further got its indipendance in medical fraternity and the world will recognize physios as Physical medicine and Rehab practitioners which they already are. This also gives idea to physios and other health care professionals that qualified physios can practice independently as well. Being a clinical Physio I am thankful of WHO. Ego of ortho will kill physiotherapy someday! Clear definition of physiotherapy by W.H.O. Physiotherapy is not a nursing, it is an independent branch in medicine like other branches. A physiotherapist can receive advices from other branches of medicine, but they have no right to give restricted instruction on treatment protocols. I am happy to hear this news as a physiotherapist because after a long struggle we got our freedom to tell as professional one not a para medical thanks to WHO who recognise our field we need this to enlarge all over the world. Right now is definitely an grow older of hugh alter. Brand new as well as ever-improving technology are usually advertised everyday as well as divorce lawyers atlanta spot of community.online paper writing service is the best one writing service for the students to prepare any college papers. The majority of people have no idea of this, but although your conventional health care university admissions software method will begin throughout Present cards with the season before accessibility, your everyday admissions method will begin manufactured a person stage feet throughout higher education! grabmyessay.com is best one and really awesome custom essay writing service providers. As well as the free of charge ISEE preparation products, several non-public businesses deliver examination getting ready courses along with a number of examination getting ready guides can be purchased at bookstores to help pupils get ready for these kinds of non-public college everyone testing. essay writers australia might help you a great deal to acquire excellent creating providers having by the due date supply.